"The orchestra, choruses, soloists and Eric Jacobsen were all marvelous. My father would have been extremely pleased, I'm sure." The contrasting sounds of Strauss, Stravinsky, Dvorak, and Bloch made for a unique evening of music, as 1000 people came to the Klein for “Moonstruck.” GBS was joined by the Fairfield County Children’s Choir in a rich performance of Vivaldi’s Gloria with GBS. Actor Keir Dullea — astronaut David Bowman from the 1968 film 2001: A Space Odyssey opened the concert, introducing The Beautiful Blue Danube; he later read Robert Louis Stevenson’s poem The Moon, to music by GBS. We also honored violinist Bernice Friedson for her momentous 63-year career with GBS; she gave an emotional performance of Bloch’s Nigun, and was presented with an original program from her first performance with GBS in 1956. 17-year-old musical prodigy Camden Archambeau (winner of last year’s Young Instrumentalists’ Competition) made his conducting debut with Dvorak’s Slavonic Dances. The evening ended with a thunderous performance of Stravinsky’s The Rite of Spring and a equally boisterous standing ovation. The most-heard comment in the lobby after the concert: “Best concert GBS has ever done!” ENCORE! 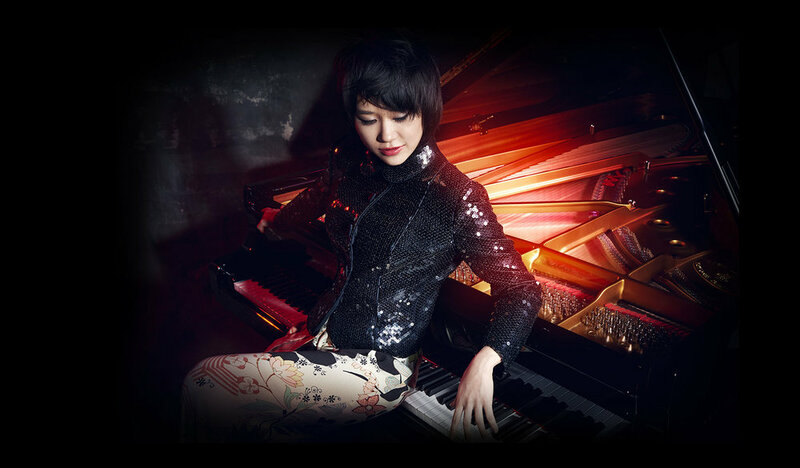 The Beijing-born virtuoso is one of the most unique and brilliant piano players in the world, known for her one-of-a-kind performances as well as her fashion-forward style. GBS was honored to bring her talents to our audience here in Bridgeport. Ms. Wang thrilled the audience with Robert Schumann’s Piano Concerto in A Minor, a musical love story Schumann wrote for his wife Clara. The music describes a struggle between enthusiasm and dreaminess, yearning and contentment, loyalty and freedom. It maintains a character of fantasy, leading to an exuberant finale. She followed with an exuberant encore — exciting variations on Mozart — that brought down the house. Also, on the program were Debussy’s famous Clair de lune (in keeping with GBS’ theme of “A Season in Space”) and Grieg’s In Holberg’s Time, interspersed such holiday classics as Bizet’s Farandole from L’Arlesienne Suite #2 (popularly known as This Great Day or March of the Kings) and Silent Night. “WE CHOOSE TO GO TO THE MOON” CONCERT SOARED! In a program organized by our good friends at Music for Youth, the Discovery Museum of Bridgeport and the Pequot Library of Southport partnered with GBS during this galactic weekend of music, providing a free event that Saturday, November 10, at 3 PM at the Pequot, called “Close Encounters with the Conductor.” This will be the second of a four-part series (the others on March 16 and April 13) at which the public is invited to speak with Maestro Jacobsen and hear him perform with other GBS talent. For the November Encounter, Discovery’s David Mestre, director of the Henry B. duPont III Planetarium, will open the program with a history of the Apollo program, and a look into the future of space travel. Jordan Kuspa and Camden Archambeau will join Eric Jacobsen to perform and talk about their music. The Discovery Museum will also be bringing a moon rock – an actual piece of the moon, gathered during the Apollo landings – to the Pequot, and to The Klein later that evening, before the concert. Discount concert tickets will be available at this event. Make November 10 special — an afternoon at the Pequot, and a night at the Symphony! This program is organized by MUSIC FOR YOUTH. Maestro Eric didn’t have to look far to find a headliner for our season opener on September 22, but the music transported our audience into the stratosphere. Colin Jacobsen performed two solos with GBS: Mozart’s exciting Violin Concerto #5 (Turkish) and Vaughan Williams’ The Lark Ascending, a musical trip to the heavens. The concert opened with great fanfare, as the orchestra boomed out Richard Strauss’ Also Sprach Zarathustra (of 2001: A Space Odyssey fame) at the beginning, and closed with Schumann’s Symphony No. 3 (Rhenish). Audience reaction to the evening was overwhelmingly positive. It was a very busy week for GBS. Amid a challenging schedule of five rehearsals, our musicians hosted 400 students from James J. Curiale School in Bridgeport at The Klein on Friday, for a rehearsal-concert, sponsored by Fairfield County’s Community Foundation. Eric kept the large crowd engaged in constant Q and A, as he led the group of 4th- to 8th-graders through the different sounds and sections of the orchestra — and they loved Zarathustra, of course! An encore was necessary at the end of the session. Eric and concertmaster Debbie Wong also visited classes at Roosevelt School in Bridgeport that day, but the big event was our night in the abandoned movie palaces of Bridgeport (see picture under the NEWS tab), where Colin and the orchestra rehearsed The Lark Ascending in the grand lobby of the old Palace Theater with a video production team. Production staff arrived at 4:30 PM and the last of load-out wasn’t done until 1:30 AM. Dedication! This video is in production and should be released in a month or so. Stay tuned! Maestro Eric Jacobsen and his brother, violin virtuoso Colin Jacobsen, took the orchestra into the old Palace Theater — grande dame of Main Street in Bridgeport, shuttered since 1972 — for a production of The Lark Ascending. The video will be online in a month or two. WHAT A WAY TO CLOSE THE SEASON! OUR SERIES REVOLUTIONS AND REVELATIONS CLOSED ON SATURDAY APRIL 28, 2018 WITH GERSHWIN'S ROUSING CUBAN OVERTURE AT THE FIFTH CONCERT OF THE SEASON, STARS AND STRIPES. APRIL 28: Said one concertgoer: "What a happy time, leaving the GBS concert, Stars and Stripes, April 28, 2018. All of us uplifted, smiling and joyous!" GBS' final concert of the season was big -- as big as the American frontier. We opened with an American song that has become familiar to millions: Jay Ungar's Ashokan Farewell for full orchestra, used in Ken Burns' 1991 The Civil War series -- a modern piece (1983) that evokes memories of America's birth and trial by fire. Then came the music of three bona fide American geniuses: Copland, Joplin and Gershwin! Aaron Copland's unforgettable Appalachian Spring and Fanfare for the Common Man were masterfully conducted and performed to the enthusiastic crowd of over 1100 at The Klein. The biggest ovations, however, were yet to come, as GBS presented the work of two composers who could have only sprung to life in America: Scott Joplin, the son of slaves from Texarkana, and George Gershwin, the Brooklyn-born son of Eastern European immigrants. A medley of Joplin's opera Treemonisha -- in a new grand operatic arrangement written (as we imagine Joplin envisioned) by Milford composer Rex Cadwallader brought down the house. The Harding High School Choir, under direction of Sheena Graham, brought unforgettable harmonies to Joplin's 1911 magnum opus. A massive standing ovation lasted nearly four minutes as the orchestra and choir took bow after bow. Then followed Gershwin's seldom-performed Cuban Overture. Like so many Gershwin compositions, Cuban Overture shows Gershwin as a 20th-century American citizen-of-the world, a true expression of the great Melting Pot. Joining the GBS pros were eight of the region's most talented brass, wind and percussion students, who had trained all season with GBS mentors on this rich and complex piece. After another ovation, Eric said to the crowd, "I don't know if I can stop laughing, that was so much fun!" Encores were certainly in order, and after playing Happy Birthday to GBS Board Chair Doris Harrington, Eric led the orchestra, the choir, and the whole audience in singing This Land is Your Land. "I had no idea I would enjoy this so much!" and "This was the best one yet" were frequent comments heard in the lobby after the concert. Unforgettable! And the concert was only half of a very big week at GBS. Eric took the entire orchestra into Bridgeport's Harding High School on April 27, where the choir provided the Treemonisha vocals. The audience of 200+ students roared their approval; said one observer, "You just got the applause Scott Joplin was never able to get in his lifetime!" Click here to hear Treemonisha by GBS and Harding High. Then Eric conducted excerpts from Appalachian Spring, and talked over the students' observations on the music. The day before, Eric conducted two chamber music classes at Fairfield Woods Middle School in Fairfield, before working with the students in GBS' Brass-Wind-Percussion Experience '18 program (generously sponsored by Robert D. Scinto and Bob and Diana Graziano. What a week! OH, WHAT A NIGHT -- C'EST MAGNIFIQUE! In our fourth concert in our REVOLUTIONS AND REVELATIONS series: Music of and after the French Revolution, Eric Jacobsen a musical tour of 19th-century France, with help from lots of great local talent! A REVOLUTIONARY GOOD TIME WAS HAD BY ALL, MARCH 3! The program then looked at the music of two French composers, whose work represents the flowering of the arts later in the 1800s, in very different ways. Gabriel Fauré’ s haunting, lyrical Requiem was performed with a wealth of local talent: the Fairfield County Children’s Choir and the University of Bridgeport’s University Singers joined baritone Thomas Woodman (Fairfield's own!). The concert concluded with selections from Georges Bizet’s most famous work Carmen, whose dramatic themes are virtually a byword for opera. The concert was preceded by a gala French-themed reception in the Upper Lobby of The Klein, supported by many members of the Fairfield Rotary Club -- new members of the GBS family! It was a busy week. Eric Jacobsen and concertmaster Debbie Wong brought the music of Kodaly and Handel-Halvorsen to two Bridgeport elementary schools -- Bryant and Jettie Tisdale -- and thrilled the young audiences. Two hundred students were on hand at Tisdale, and many attended the concert the next night. HOLIDAY INTERLUDE A BIG HIT AT THE KLEIN: GBS' DECEMBER 16 CONCERT FEATURED ALLISON ELDREDGE AND OTHER HOLIDAY SURPRISES. Holiday Interlude mixed exquisite Tchaikovsky with holiday singalongs, featured great young talent, and sent the audience home floating on the cold winter air. Eric Jacobsen charmed the crowd of over 1100, and welcomed the fabulous cellist Allison Eldredge to the stage at The Klein, along with prodigies Zoe Lonsinger (violin) and Hudson Ragins (piano). Bridgeport's own chanteuse Maureen Hamill joined in the fun, bringing friends and 17 youth singers from the After School at The Klein (ASK) program along to lead the singalongs. "This is the best holiday concert I've been to in years!" said many concertgoers. Jacobsen blended Tchaikovsky's Symphony No. 5 and excerpts from The Nutcracker with Strauss' Tales from the Vienna Woods and such seasonal favorites as O Holy Night, Hanukkah Night, Hark The Herald Angels Sing, Silent Night and Joy to the World. A highlight of the night came at the top of the second half, when Allison Eldredge on cello led her students Lonsinger and Ragins in a masterful trio version of Waltz of the Flowers, joined by the entire 53-piece GBS orchestra for the finale; the ovation lasted several minutes. "This is my favorite time of year!" said Jacobsen from the stage. It showed! GBS musicians were thrilled to be part of Cirque Musica, a nationally-touring holiday show, at the Webster Bank Arena on December 12. GBS provided rich symphonic sound to a performance of song, dance, slapstick and heart-pounding aerialist acts. "We were greatly pleased at the huge number of children who attended," said Arena VP Charles Dowd. GBS couldn't agree more: today's kids need to expericnce symphonic music and high-quality live performances. It's hoped that Cirque Musica may become an annual event in Bridgeport. ¡BIENVENIDOS AMIGOS! WHAT A NIGHT! GBS BROUGHT THE MUSIC OF THE CARIBBEAN AND SPAIN TO ITS OCTOBER 28 CONCERT ARRIBA ESPAÑA AT THE KLEIN IN BRIDGEPORT. The October 28 concert was the second of GBS’ 2017-18 series Revolutions and Revelations, an exploration of the effects of political revolutions on music. Guest conductor Donald Palma led GBS through a night of Latin American and Spanish rhythms. Arriba España centered around Joaquin Rodrigo’s guitar concerto Concierto de Aranjuez, a composition written at the end of the Spanish Civil War. Noted guitarist and composer Benjamin Verdery thrilled the audience with this evocative piece, considered a calming influence after the tumult of Civil War. For many years, the music was used by Spanish politicians to celebrate the victory of Franco, but it is, in reality, an emotional autobiography of Rodrigo himself. GBS raised several hundred dollars for Puerto Rico hurricane relief through Americares. Thank you to our generous concert-goers! We also hosted a Latino feast before the concert in the upper lobby of The Klein, with delicious food from our friends at L.A. Tavern in Black Rock. Future theme receptions will take place before our March and April concerts next spring. GBS hopes to see our new friends again on December 16, when we present Holiday Interlude -- a night of The Nutcracker (and another of Tchaikovsky's great works, the Fifth Symphony), Strauss (Tales from the Vienna Woods), familiar holiday favorites (with singalong!) . . . and a few surprises! Below: our soloist for October, Benjamin Verdery. september 16 season premiere a big hit! Eric Jacobsen returned to our podium for his fourth season with a survey of Russian music, before and after the Russian Revolution of 1917: Glinka, Paert, Rachmaninoff and Shostakovich. Piano virtuoso Alex Beyer performed a rapturous Rhapsody on a Theme of Paganini, followed by an encore and several minutes of standing ovation. The concert was preceded by a gala Opening Night Reception in The Klein's upper lobby -- Moscow Mules (with vodka made locally by our friends at Asylum Distilleries of Bridgeport) and sumptuous Russian hors d'oeuvres. "Music Lovers of the World Unite" was the first of five series concerts this season, three others of which explore the music of the Spanish Civil War, the French Revolution and the American Revolution. The December concert will, as usual, feature holiday favorites with great classics associated with the season. Hear more about the concert and the season in this WICC interview. Our fourth Barnum Festival concert the best one yet! Perfect weather, thousands of people, fantastic fireworks, and the best music on earth made for a memorable evening at beautiful Seaside Park in Bridgeport on June 24. Eric Jacobsen conducted our musicians in stirring patriotic songs -- Stars and Stripes Forever, the Washington Post March, the Armed Forces Medley, America the Beautiful, and, of course, our national anthem, then launched into previews of next season: Carmen and instrumentals by the great African-American composer Scott Joplin (who was born nearly 150 years ago -- 1868 -- and died 100 years ago this past April). Marvelous homegrown talent -- Bridgeport's own Maureen Hamill -- sang great Broadway numbers, with help from the kids from the ASK (After School at The Klein) program. GBS finished the 1812 Overture on cue with the start of an epic pyrotechnic display that rocked the large crowd. DON'T MISS THIS NEXT YEAR! GBS IS CERTAINLY LOOKING FORWARD TO A RETURN ENGAGEMENT! THANK YOU, BARNUM FESTIVAL FOUNDATION! buy tickets for upcoming concerts! Great seats available. Bach and Beethoven closed our 71st Season on April 22 at The Klein. Guest Conductor Jonathan Yates charmed and thrilled our audience. Our final season concert included Stravinsky's Dumbarton Oaks, Bach Piano Concerto in D (Soloist: our guest conductor, Jonathan Yates), and concluded with Beethoven's Sixth Symphony, the famous Pastoral. Jonathan's lively style and vivid descriptions of each piece made for a memorable night of music. It just gets better and better at GBS! Come and be part of our musical family next season. First Prize winner Max Moon of Fairfield and Second Prize winner Kate Wegener of Easton are congratulated by Mrs. Jean Moffitt, GBS President, and Mrs. Doris Harrington, Chairman of the GBS Board of Trustees. Third Prize winner Eric Hirsch was unavailable for the photo -- already off to another competition! become a 3-concert Silver Subscriber in 2017-18! 15%-20% discount! Chichester Psalms and West Side Story Symphonic Suite anchored a great evening of music at The Klein on March 18. The concert also included Ravel's Tzigane(soloist our own Deborah Wong) and Debussy's Nocturnes. GBS was pleased to welcome voices from the Connecticut Chamber Choir and the Fairfield County Children's Choir for this extraordinary concert. Concert week was full of activity, as usual -- including an open rehearsal at Bridgeport's Bassick High School, visits to two Bridgeport elementary schools, and a TV appearance with Eric Jacobsen and his wife, singer/songwriter Aoife O'Donovan. Bernstein at 99! was sponsored by Peoples United Bank. GBS is a proud partner in education in Bridgeport. On March 16 -- two days before Bernstein at 99! at The Klein -- GBS played Bernstein's West Side Story Symphonic Suite and Debussy Nocturnes for honor students and special education class in the auditorium at Bassick High School in Bridgeport. "This is an important part of our mission -- to educate the youth of Greater Bridgeport -- and it's a return to our roots," said GBS President Jean Moffitt. 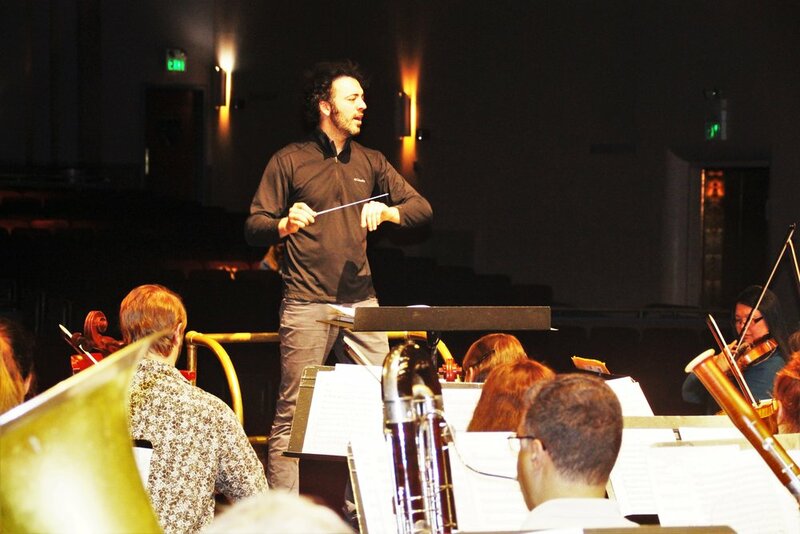 "In the earliest days of our organization, our orchestra performed in Bridgeport high schools, and it changed lives. We want to continue that proud tradition." Indeed, GBS -- in its original iteration, as the "Bridgeport Symphony" (a WPA Arts Project), GBS brought great music to the auditorium at Central High School in the late 1930s. In this anniversary year, GBS is thrilled to be able to share our music with today's youth. See the News12 TV coverage of the event. GBS TEAMS WITH GBYO FOR LA BOHEME AT THE KLEIN. "Worth going out in any kind of weather to see!" Despite sloggy winter weather, GBS played to a nearly full house on Saturday, December 17 with a rousing, emotional performance of Puccini's great La Boheme at The Klein in Bridgeport. Graced with the formidable talents of soloists Laquita Mitchell (Mimi), David Blalock (Marcello), Ariadne Greif (Musetta), Alexander Elliott (Rodolfo), Benjamin Bloomfield (Colline), and Thomas Woodman (Schaunard -- a resident of Fairfield! ), GBS thrilled its audience after 15+ hours of rehearsal the previous week. Eric Jacobsen also welcomed the Principal Orchestra of GBYO to the stage. In a surprise appearance (the first time GBYO has performed at a regular season concert with GBS in over three decades), the upper strings, brass, wind and percussion sections of GBYO marched in as the Stage Band, (rescuing the Bohemians from paying their dinner tab), to the delight of the large audience in attendance. Seventy-five GBYO musicians then joined GBS on stage for Act IV of the opera, plus a grand rendition of Bizet's Farandole from L'Arlesienne Suite #2, better known at this time of year as the Christmas carol This Great Day. Jacobsen sprinkled Silent Night, The Festive Sounds of Hanukkah, Joy to the World and What Child is This into the program; the latter piece was performed by 16-year-old soloist Julian Shively of Trumbull, winner of GBS' 2016 Young Instrumentalists' Competition. Shively is also principal cellist for GBYO. "We're so glad we braved the weather," said one newcomer to GBS. "We know, now, that we don't have to go all the way into New York City to experience great music." A big night at GBS! A huge audience heard guest conductor Ted Sperling conduct the music of the movies on November 12, accompanied by stills from over twenty different motion pictures. Ted's commentary added to the night, as he related his experiences in film and theatre to the music presented. The crowd thrilled to a wide variety of music, from Beethoven to John Williams, Scott Joplin to Pietro Mascagni, from movies such as Gone With the Wind, The King's Speech, The Godfather III, Raging Bull, The Pink Panther, The Sting, Crossing Delancey, Platoon, Fantasia, Schindler's List, Star Wars, and many, many more. Lucky concertgoers were given boxes of GBS popcorn on exiting The Klein, complete with prizes inside. We saw a lot of young, new faces in the crowd. Come back and see us again! CONCERT WEEK IS ALWAYS AN EXCITING TIME AT GBS! Everyone knows about our concerts. They're big events, with scores of talented musicians coming together to make music for a big crowd. Opening night is always a special time: anticipation, meeting old friends (and making new ones), great music, and the house exploding in applause. There's so much more behind the scenes: months of preparation for the season, followed by an intense week of activity. Fifty-three dedicated GBS musicians rehearsed twelve hours to make our concert of Beethoven, Shostakovich and Dvorak. Piano soloist Alex Beyer worked diligently to present a brilliant Beethoven concerto. That's just part of what GBS is. During the week before the concert, Eric Jacobsen visited two Bridgeport public schools with our concertmaster, Deborah Wong. They performed Handel-Halvorsen and Kodaly at High Horizon Magnet, Multi-Cultural Magnet, and Roosevelt Elementary School to audiences of enraptured students, many of whom are young musicians. Eric then invited the kids to make up a story, which could be told in music. As they shouted out "It's a cloudy night!" and "Somebody's waiting around the corner!" Eric put music to their ideas on his cello. "It's all about fostering creativity. Use your imagination -- be creative! That's what makes the future something to look forward to," Eric said afterward. Free tickets were offered to any student (and his/her family) for the Saturday concert, and many attended. Eric also did radio interviews and performed The Swan on CT Style (WTNH New Haven), in the process making an impromptu musical weather report with meteorologist Gil Simmons. On Friday of concert week, Eric accompanied Alex Beyer to Fairfield University, where Alex and Professor Alan Murchie performed a dual piano version of Beethoven's 2nd Piano Concerto at the Quick Center, in a free concert for Fairfield students and the Lifelong Learners group. Even before rehearsals for the first concert of the 71st season were over, Eric was meeting with GBS' Music Advisory Committee to begin designing next season. Big things are in store! Come see our next concert!